My wife and I went to North East, Pa. with her folks and not only hit up some antique shops, but also bought a couple bottles of wine along the way. Here in Jamestown, we live near the Lake Erie Wine Trail — so weekend tasting is a regular part of summers in Chautauqua County. We started at South Shore Wine Company, which is a winery located in North East that’s part of the Mazza group of wineries. Mazza has two other locations, both in Chautauqua County, my favorite of which is right across from Johnson Estate Winery — but more on that in a bit. The South Shore location was a great place to visit because the main room is in an underground, cavernous, stone room that’s just neat to experience. And even better, there’s wine to taste while you’re taking in the history. I tasted two wines and three meads, their Gruner Veltliner and Noiret for wines — and also their honey mead, raspberry honey mead and a carbonated mead called “Hops & Honey,” made with hops and more. The gruner veltliner was very good and I wish I would have gotten a bottle, but the appeal of having some honey mead was more appealing. Not getting a bottle of the gruner veltliner just means I’ll have to go back soon, and I wonder if the other Mazza locations sell that same gruner veltliner that South Shore was selling. Earlier I mentioned that one of the Mazza sites is located right across from the Johnson Estate Winery. Those two sites are located right on Route 20 in Westfield and are a couple of my favorites because they offer more than just wine to taste — they have spirits. The Mazza location has its own distilled spirits to taste, made and marketed under the Five & 20 name. The Johnson Estate Winery doesn’t distill spirits, but it does have what it calls a “New York Statr Spirits Tasting Bar.” Basically, there’s a second station in the winery’s tasting room where you can taste boozes which were made in New York State. At Mazza, in addition to wine and spirits, there’s a launch party for their brewery’s first beers this weekend — making Mazza and Five & 20 the first combination winery, distillery and brewery in the state. I picked up this pocket cocktail pamphlet at a household sale in Lakewood, N.Y. This was one of six vintage pamphlets I picked up at a local household sale. I’ll post the rest soon. And maybe one day I’ll get around to transcribing the recipes. The thing with a pamphlet like this though is that it specifies its particular brand in all of the drinks which are listed. They’re great to own for the art and phrasing though, especially the party books for hosts and hostesses. Those ones have hilarious little cartoons and suggestions for party games and canapés and all sorts of other stuff. This pamphlet’s a more straightforward set of recipes. 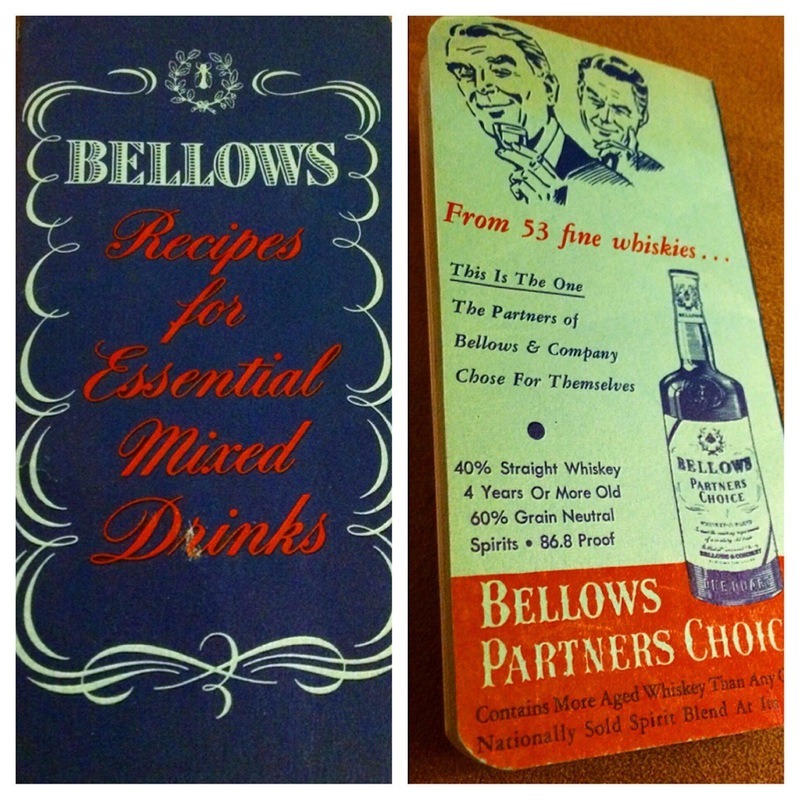 I just did a quick Google search and found a few of these Bellows books available for sale online. Not sure of more than that though. From what I can find online it maybe printed in 1949? Or 1950? 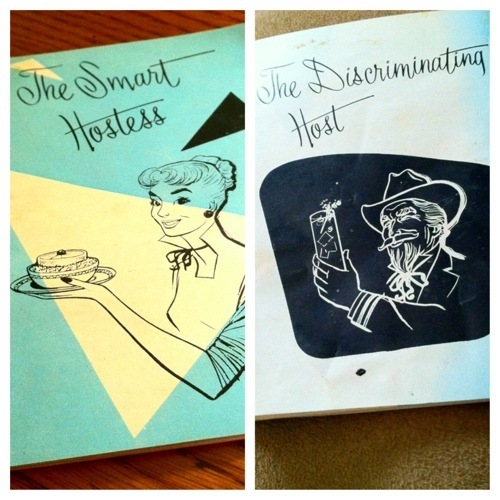 I picked this up at a house sale: The Smart Hostess! It’s a pamphlet printed by the Rival Manufacturing Company in 1954 or 1960, I’m not seeing a whole lot about it anywhere on the internet. 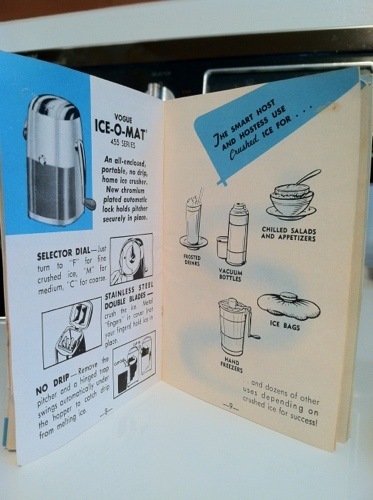 The first section of the pamphlet has ads for the Ice-O-Matic Electric Ice Crusher, The Bucketeer Ice-O-Mat, the Two-Way Ice-O-Mat and the Vogue Ice-O-Mat.